Membership in the Association is available to residents, as well as property owners in the Haw Creek community. We strive to keep Haw Creek a great community. 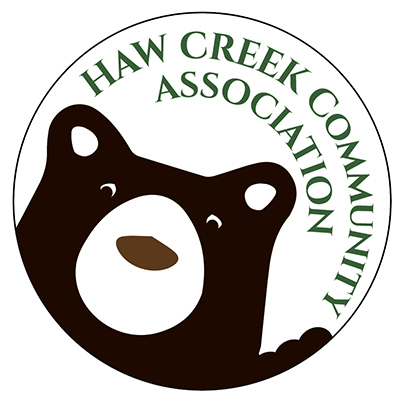 The Haw Creek Community Association needs your participation to keep the community flowing. We manage this website, a Facebook page, and a nextdoor page. We also provide the community with newsletters and events. We rely on people who live in the community to volunteer to help us in these endeavors. Along with volunteers we need funds to help the process. In a effort to make memberships affordable for everyone, we keep the amount low. The HCCA is an IRS 501(c)3 tax-exempt organization and all dues and donations are tax-deductible. You may pay by check or pay online through PayPal (no PayPal account necessary – credit cards accepted) by clicking on the “donate” button below. If not printed on your check, please write: member names, postal address, phone number, and e-mail address in the memo area.